Advent calendars have always been such an important part of the countdown to Christmas for me. But aren’t they often just a little bit of a disappointment? The chocolate calendars so often contain the lowest grottiest grade of milk chocolate imaginable, and the plain card ones are, well, a bit plain! 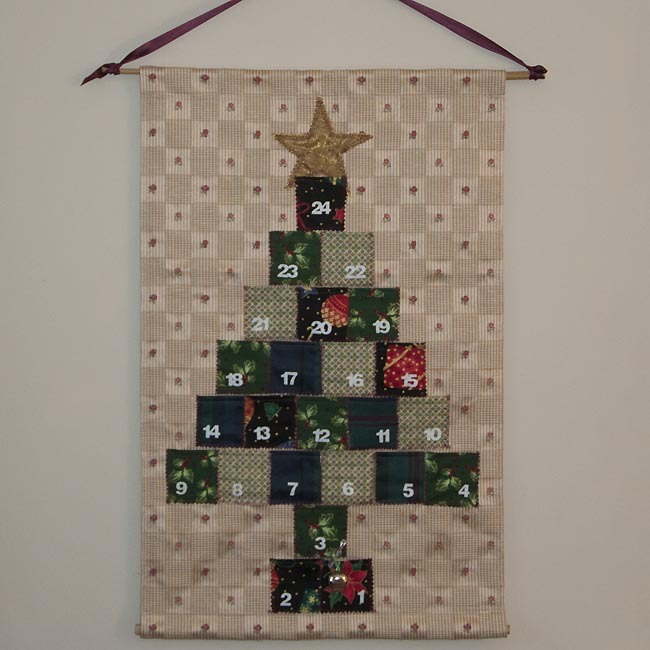 The last few years I’ve seen a few beautiful fabric advent calendars with pockets, which sadly have always been a bit rich for my wallet. So after I’d got out my bits and pieces of Christmas fabric scraps for bunting making a couple of weeks ago, I thought, surely I might be able to make something of my own? A large piece of heavy fabric for the backing. The piece I used was about 45 x 80 cm, but obviously this will vary according to your design. 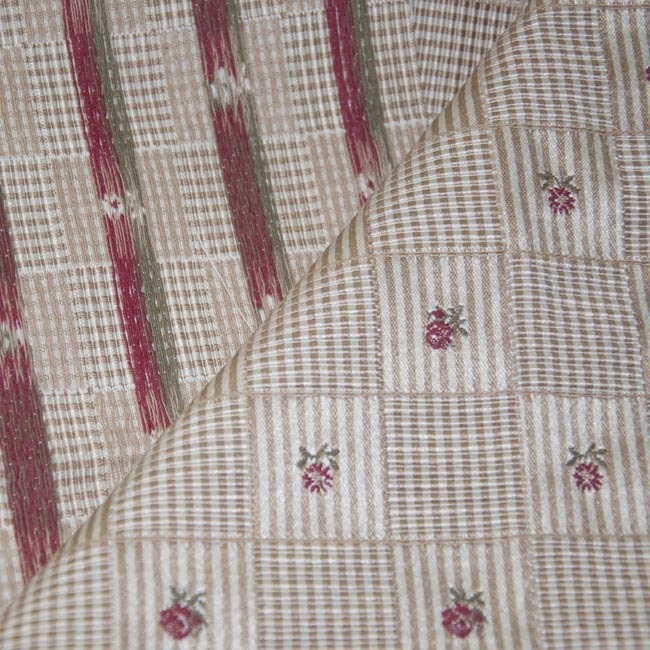 Enough scrap Christmas-coloured fabric for 24 pockets and something pretty for the top of your tree. A bamboo cane and some ribbon. A sewing machine capable of straight and zig-zag stitch, matching and contrasting threads. I was lucky to have some quite heavy, checked, gold-coloured fabric in my scraps bag which was big enough to use as backing fabric. Even better, the approximately 1″ squares of the pattern made a fantastic layout grid for the advent calendar, saving me a huge amount of hassle. 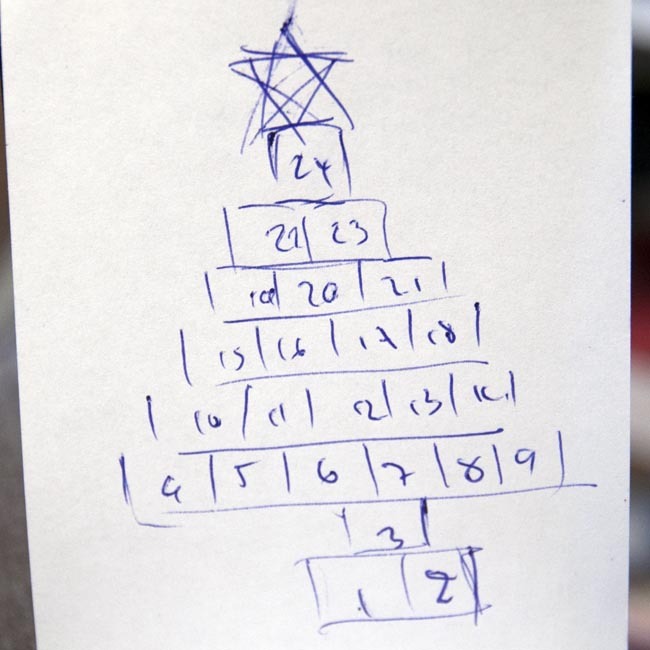 I doodled out some boxes, and realised with some pleasure that I could build up a stylised Christmas tree out of square pockets using a very convenient 24 squares – result. 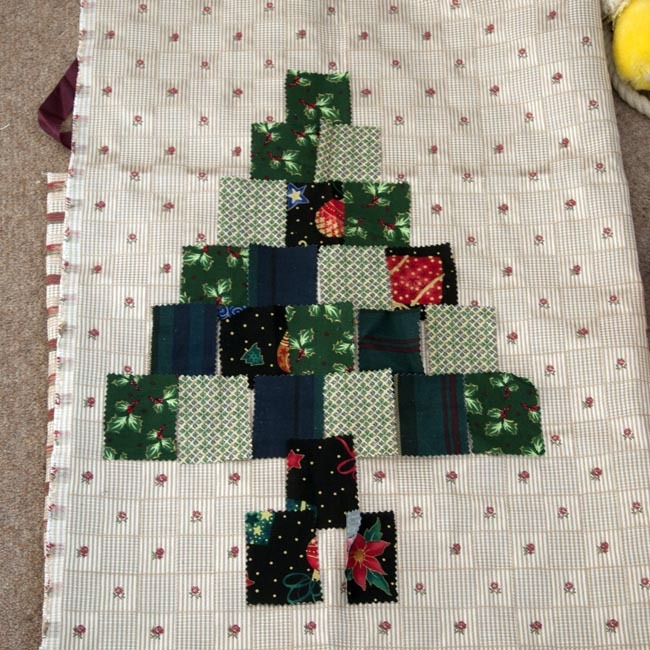 Then I had a dive around the random collection of Christmas fabric scraps I’ve collected over the years, particularly the annoying-sized offcuts I never seem to be able to bring myself to throw out on the basis they’ll come in handy some day! Out of some card, I cut myself a pocket template based on the squares of the backing fabric, two boxes wide and two and a half boxes high. I used this to mark up, and then cut out my 24 pockets out of a mix of fabrics, using pinking shears. Now it’s time to play about with your pockets to decide on a pleasing arrangement of the different fabrics. It took a few tries but I pretty quickly came up with an arrangement I was happy with. It’s also the time to decide how you want to arrange your numbers. I decided to count them down from 24 at the top of the tree, down to 1 in the pot, but you could arrange them randomly or in some other pattern of your choosing. I was feeling really chuffed at having found 24 small felt numbers from a craft supplier to use on the calendar pockets. I can in no way recommend that you do the same thing, and here’s why – having decided on the layout of the patches, it’s time to number them. The felt numbers were far too small and fiddly to sew on with my machine, so I hand stitched them to the pockets. It took me a whole evening in front of the TV (not joking, it took over three hours – as much as the rest of the project put together!). There must be faster ways – I suppose I could have used fabric glue but I didn’t have any. Fabric paint or iron on numbers may be a solution. Of course if you have a marvellous programmable embroidery machine, you could just embroider them on. If you do, you should know that I’m extremely jealous! Once all your numbers are in place (or before, if you’re paining or ironing on) iron your pockets with the top hem folded over, and then just trim the corners of the fold with the pinking shears. Then stitch the hem over with a closely matched colour of thread. 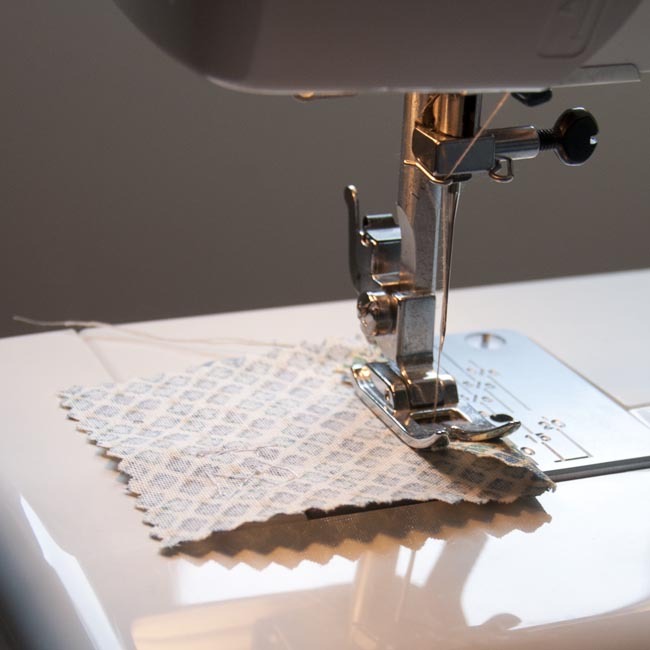 Now is the time to cut and hem your backing fabric, too. I used a wide zig-zag stitch to do the hemming, which avoided having to do any other finishing. Give yourself enough fabric top and bottom to hem a pocket big enough to thread a bamboo cane through later. Now lay out all your prepared pockets. Also cut yourself a star, or other decoration for the top of your tree, out of a suitably spangly fabric. Now it’s time to sew the pockets onto the backing fabric, which you will have to do a row at a time starting at the top. 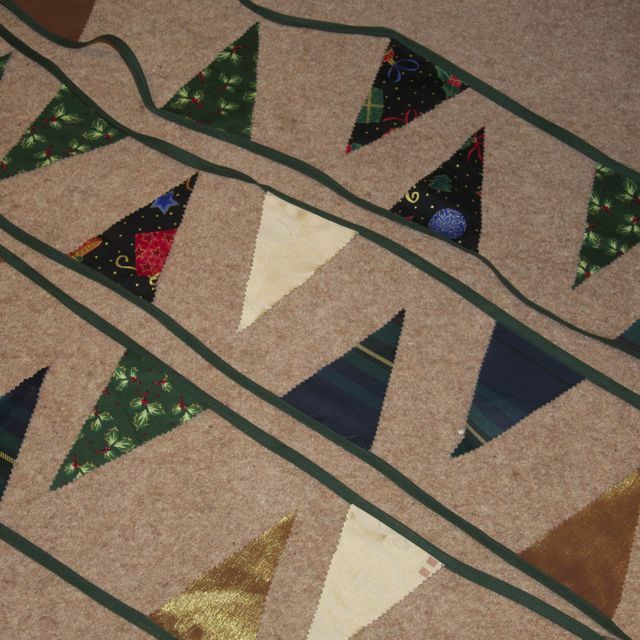 First pin your star in place and then, with an appropriate contrasting thread, appliqué it in place. I used zigzag stitch, because I like the effect, and a dark red / burgundy thread, but you should do whatever you like! Then, a row at a time, do the same with the pockets, sewing the sides and bottom onto the backing fabric using a zigzag stitch. Try to make sure you catch both sides of adjoining pockets in the stitch. Obviously don’t stitch the tops of the pockets if you’re going to want to put anything in them! Oh, and mind your fingers on the pins as you work – or at least, try not to stab yourself *too* often. If you don’t quite manage to catch all the edges, you can correct this later by hand using matching rather than contrasting fabric to make the corrections. It will look hand-made, which is the point, after all! Once you’re all done, cut two lengths of bamboo, one a bit longer than the other, and some suitably coloured ribbon to hang the calendar with. I used a spot of fabric glue (yes, I’d learnt my lesson and bought some by then!) on both ends of the top bamboo cane to stop the tied-on ribbon from slipping. I also used a little scrap of ribbon to tie a jingle bell to a tiny peg to use as a marker to move along from pocket to pocket as December ticks away. That’s it, sit back and admire your handiwork! And perhaps pour yourself a nice beverage – go on, you’ve earned it! Buoyed up by the success of my first attempt at curing and smoking a very small salmon tail fillet, and tempted by the whole sides of salmon that appear in the shops at this time of year, I thought ‘hey, why not?’ and asked my husband to pick one up when he was shopping. Having got it home and looked at it, in all it’s 1.75kg glory, and about an inch and a half thick at it’s thickest point, I did wonder if I hadn’t perhaps bitten off a bit more than I could chew… so like any sensible experimental cook, I put the thought firmly to the back of my mind and got on with it anyway. Before curing I decided to add a bit of flavour to the fillet in the form of a bit of a whisky infusion, so a tot of Laphroaig went into the bag with the fillet for an hour or two. In retrospect I should have got the fillet out, washed and dried it and deprived it of its pin bones before doing anything with whisky, as I’m pretty sure that most of the flavour I added got washed away at this slightly later preparation stage. Lesson learned! After that, I cut the fillet in half (none of my oven dishes is anything like long enough to take a whole fillet in one go, and my fish kettle is metal and not really suitable for curing) and rubbed it generously with the cure mix which, as last time, is 2/3rds table salt and 1/3rd golden caster sugar. In aiming for a very short cure period (about 6 hours) I’m keen to make sure the pickle doesn’t become unsaturated, so I use a lot more cure mix than I probably need to in order to get maximum water extraction during the short contact time. I made up about a pound of cure mix, though I didn’t use it all. Once rubbed in the cure, with a thin layer in the dish beneath the fish, I covered the fillet pieces with cling film and weighed them down with most of the canned goods in my larder! I turned them every couple of hours. At the end of the six hours a really quite striking amount of liquid had been drawn out of the fillet by the osmotic action of the salt and sugar. More striking than that was the effect of the curing process on the salmon skin, which had reverted from the rather soft pliable texture you expect, to a firm, almost cardboard-like texture with the beautiful blue iridescence you would normally see only in the skin of a freshly caught fish. More culinary alchemy, and quite beautiful! After washing and drying, the salmon pieces went into my fridge on open racks overnight. The next morning, they were part of the second smoker run, and smoked for 10 hours over a mix of oak and apple wood. After smoking I portionned the fish for freezing, which also gave me a good chance to examine it in cross-section. The thinner tail piece is perfect, I think. 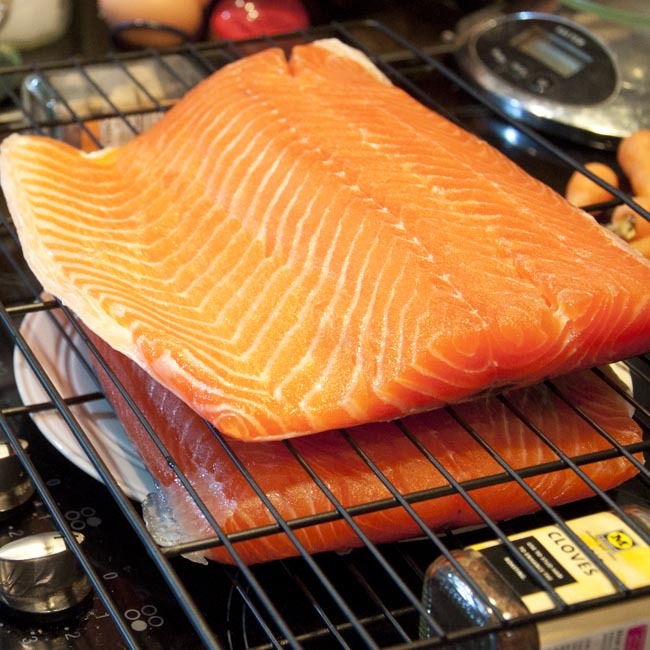 I cut some slivers from the surface and tasted them fresh from the smoker, it’s some of the best smoked salmon I have ever tasted – a gentle saltiness and sweetness, the oiliness of the fish mixing with a soft smoky flavour and perhaps, with a little faith, even the faint bite of the whisky in the background. 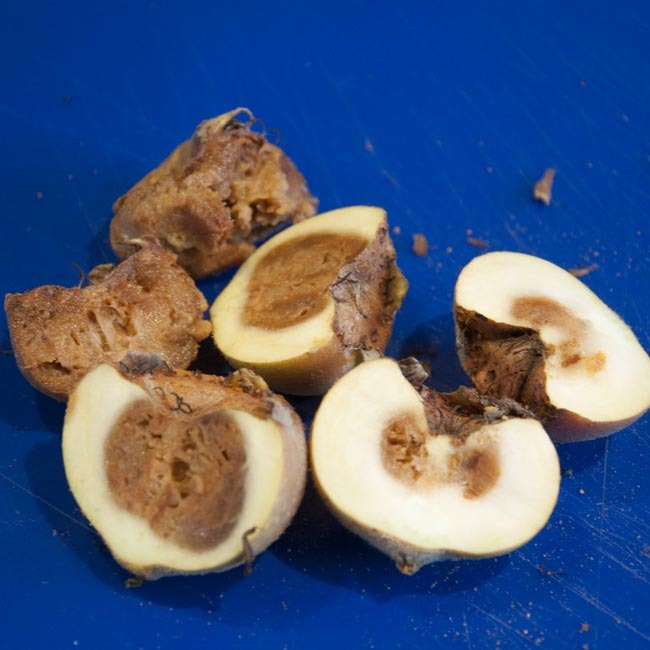 In cross section it is an even translucent orange-pink all the way through and a nice firm texture. The thicker head-end half of the fillet is not quite such an unmitigated success. There is a clear visual and textural distinction between the skin 1/3rd of the piece and the rest, with the flesh nearest the skin softer, pinker, and with more distinct fat-lines visible. 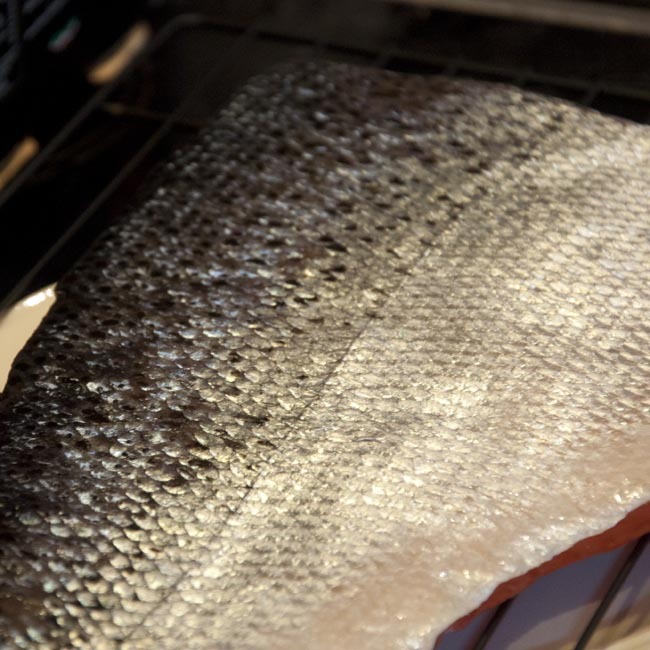 In all respects, this part of the fish is much closer in appearance to a fresh fillet than to a cured and smoked one. I can only assume that the cure mix was not able to penetrate well through the skin (which in retrospect I should have checked was properly scaled) and had not had the time in the cure to be reached from the other side. It’s not a terrible disaster as these pieces are now frozen and will be perfect to use in dishes like the creamy smoked-salmon pasta, but I don’t think they’re suitable for eating raw. Skin the fillet – not appealing as a plan, as it will reduce the structural integrity of the fillet and make it harder to slice thinly as smoked salmon later, also I think skinned fillets are a lot less visually appealing! Do something to the skin side to help it absorb the cure better – certainly making sure the skin is fully scaled may well help here, but I’m also tempted to do something in the way of shallow piercing / scarifying of the skin to help the cure penetrating. I have ordered (Amazon to the rescue again) a device called a blade tenderiser, intended for making lots of stab incisions in steaks before cooking, which I think with some minor modification to control the stabbing-depth may well do exactly what I want to the skin on the thick end of the fillet without too much faff. Watch this space for the third effort – I’m running out of time before Christmas now so the third time had better be the charm! It was obvious on the first burn of the DIY cold smoker that despite my best woodworking efforts (I do *not* possess joinery skills!) it leaked like a sieve from almost every edge and corner. It was always going to be an iterative design process, so we broke out the mastic and panel pins and sealed the sides as best we could. Then I cut and fixed batons along the edges of the slate roof to improve the seal between this and the sides of the smoker box. After leaving it overnight for the mastic to go off, it was time for the second burn. The morning dawned unconvincingly, grey damp and foggy. Even the hens seemed unimpressed when I opened their pop door before turning my attention to getting the smoker set up for its second outing. I chose a mix of oak (~70%) and apple (~30%) dusts for my second burn. 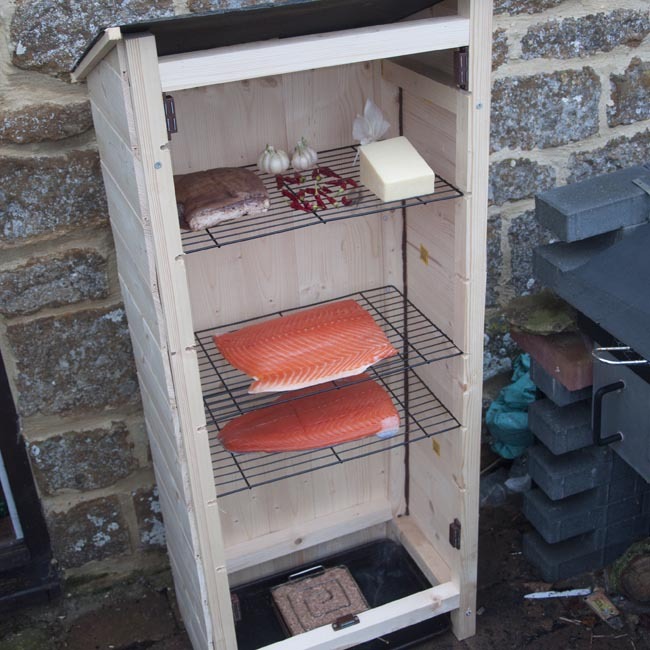 In the smoker I had a whole side of cured salmon, my experimental Christmas bacon, a slab of cheddar, the bulb and a half of garlic from my first smoker run which hadn’t already been eaten, and a mix of already-smoked and unsmoked chillies. Oh, and a little muslin bag of sea salt. It was more or less full. The smoker was greatly improved by the modifications, and breathed whisps of smoke out through the intended ventilation gap at the front steadily for about 11 hours. The burn time was longer on this occasion, and I’m not sure whether that was due to the different mix of wood dusts or the weather (it stayed damp and foggy all day and never got above about 7 degrees celsius). The apple smoke smelt wonderful, sweeter and softer than the 100% oak from the previous burn. I plan to write more about the salmon in due course. The bacon took the smoke very nicely and I’m very pleased with the results. The garlic has definitely benefitted from a longer total time in the smoker, so I suspect I’ll batch garlic smoking to weekends I plan to run the smoker for two consecutive days to give a stronger smoke. The cheese was a request from a friend, so we await the verdict! As for the salt, it *smells* of smoke, though that may be the muslin. I’m gratified that it doesn’t appear to smell of salmon at all. It looks entirely unchanged – photos of caramel-brown smoked salt I’ve seen on other blogs aren’t the case here, though most of those have been hot-smoker efforts – but I look forward to tasting it soon! I’ve now made a couple of flavoured bacons, which I’ve then smoked in my DIY cold smoker. This is a lovely eating bacon, and is likely to become one of our house staples. The pepper adds mostly flavour, very little heat. The sweet flavour from the sugar is subtle, but present, and adds nice balance. It cooks well, too. Highly recommended. I think it would also be very nice unsmoked. While the cure did smell a bit medicinal, with a dominant smell of clove, despite the tiny quantity of clove added, it did at least smell convincingly of Christmas. The molasses sugar gives the cured bacon a really distinctive dark colour to the flesh and to the rind. Smoked over apple and oak wood dust, it has a lovely sweet complex slightly spiced flavour, and is almost exactly what I was looking for in a Christmas bacon. It is probably more suited to a cooking bacon (and would make awesome ‘pigs in blankets’ for Christmas dinner) but does also eat very well, caramelising beautifully, if my lunch today was anything to go by! Everyone loves a real fire! 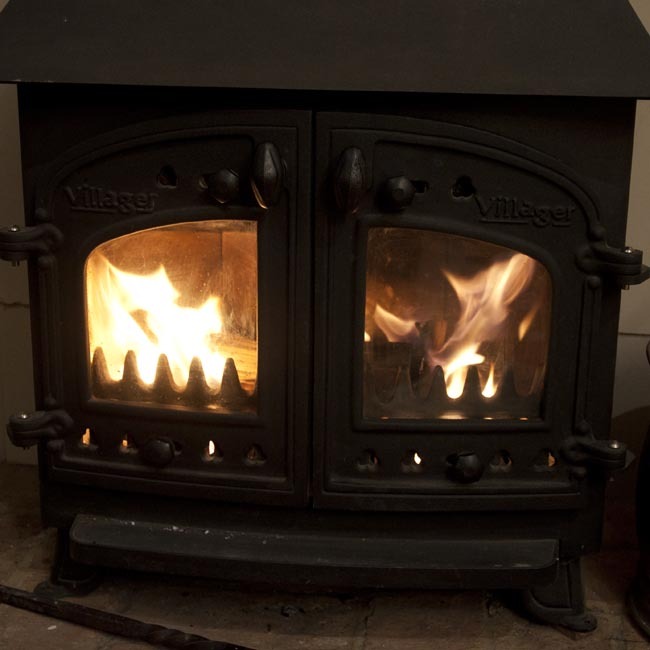 In common with lots of people in rural homes without access to the mains gas network, we use a multi-fuel stove for some of our heating. 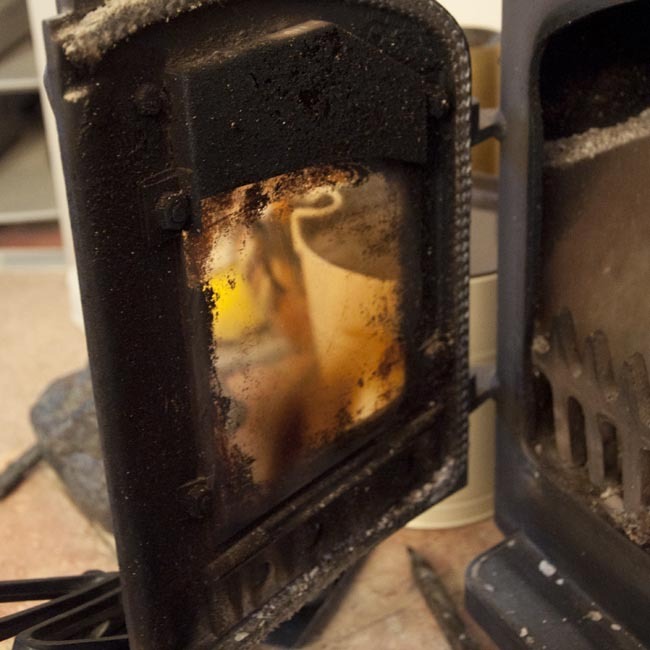 Wood burning stoves are becoming more popular in urban areas, too. 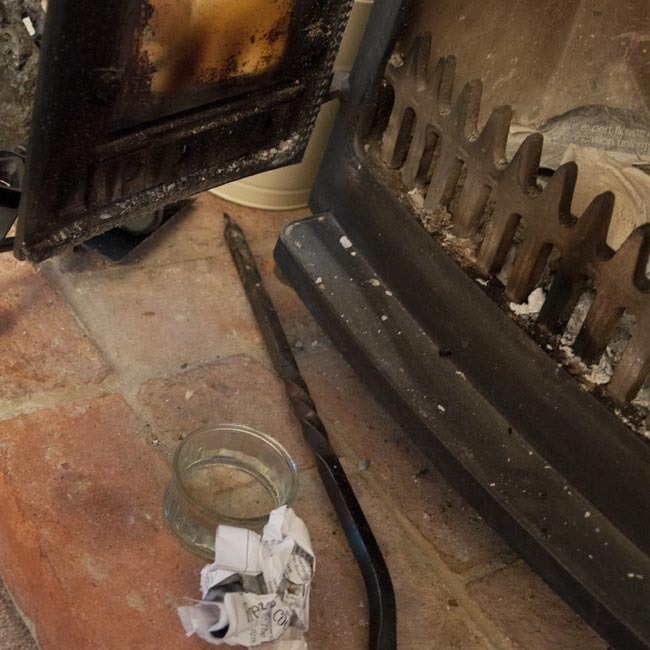 If you have an old stove, it’s likely that before too long you’ll find yourself having to work out how to get the soot off the glass. I’ve tried oven cleaner. I’ve tried multisurface cleaner. I’ve tried a pan scourer, soap and hot water. Giving it a damn good scrub works a bit, but is very hard work. 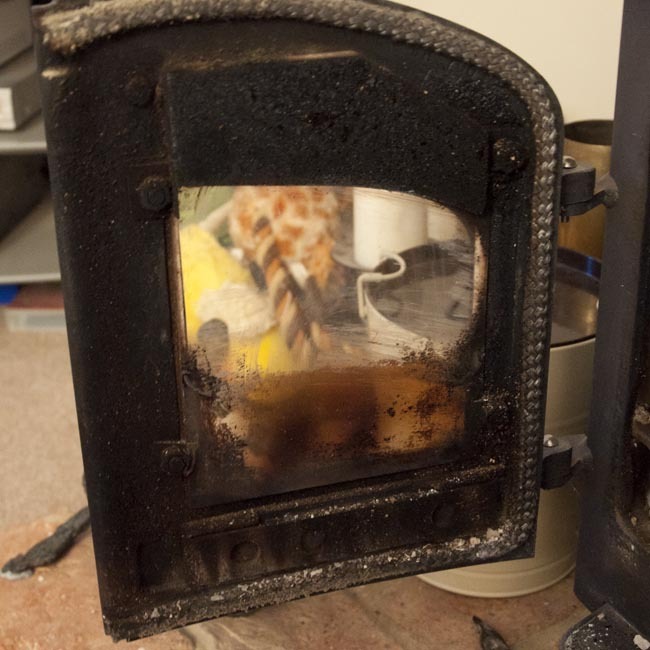 I’ve even tried expensive, specifically designed cleaner for the glass on multi-fuel stoves. Nothing worked convincingly or easily, and the stuff in the aerosol stank, too. Meanwhile the glass was getting blacker and blacker, and we were deprived of the gorgeous sight of flickering flames, to the point that we were wondering how easy it would be to replace the glass. The answer is as easy as could be. No solvents or volatile chemicals, very little effort, and you have all the things you need already. Strange as it may seem, you need some newspaper, some ash, some tap water, and a very little elbow grease. 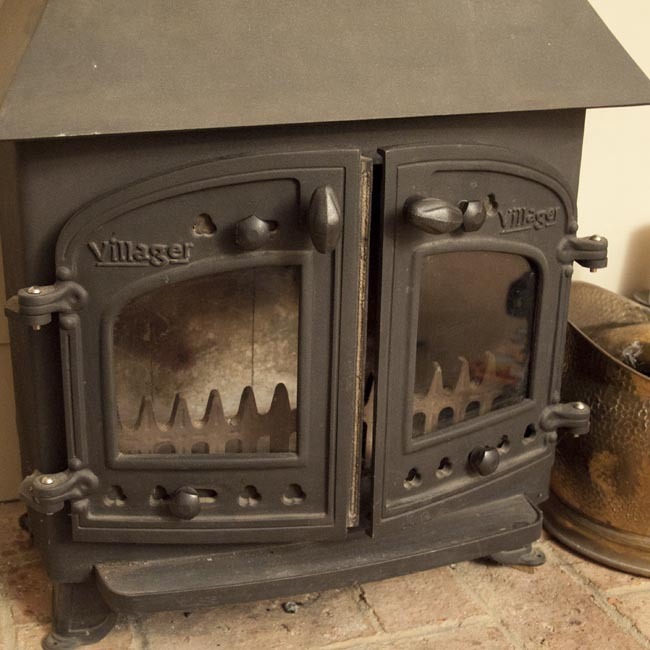 And a wood-burning or multi-fuel stove, of course, but if you haven’t got one, you probably haven’t bothered to read this far. Scrunch up about half a sheet of newspaper. Dip it in the water and squeeze out the excess. Then dip it into the ash. Now use this, gently, to rub the glass. You should notice it working straight away, which is very gratifying. The water and ash forms a really fine abrasive slurry, which lifts the soot from the glass with very little effort. When the paper starts to get really black and stops working again, get a new piece, and repeat the process as often as required. Getting both doors of my fire cleaned took about half an hour. They’re *sparkling*. A small word of warning – if your glass has some sort of clever protective coating, this approach may not do it any good… Then again, if your glass has some sort of clever protective coating, and is still sooted up, you might reasonably take the view that it’s not working anyway! Go on, try it! I know it sounds mad but I promise you won’t be disappointed! 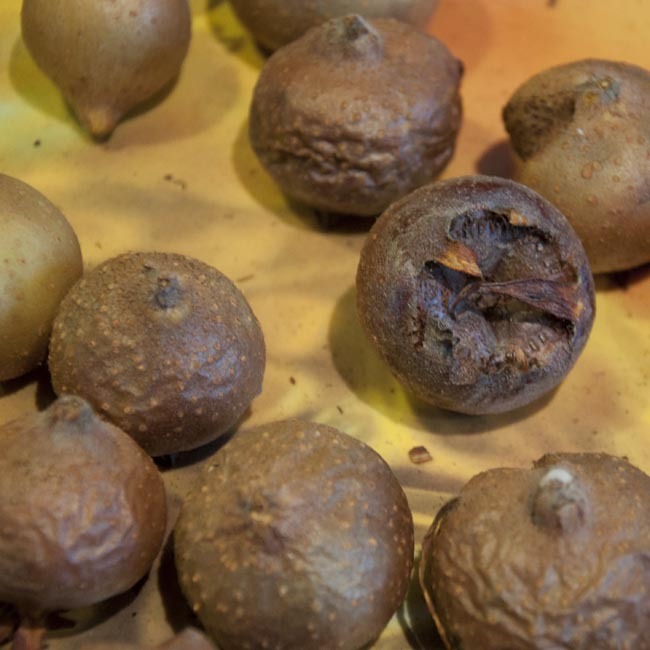 After two and a half week’s bletting in the spare bedroom, about half the medlars looked unchanged, the other half had softened and darkened in colour, with skins that look and felt a bit like nicely ripened passion fruit. I was itching to get on and, in any case, had read in a couple of places that having some un-bletted medlars in the mix would help with setting the jelly, as they are higher in pectins. Brilliant then – time to get going! 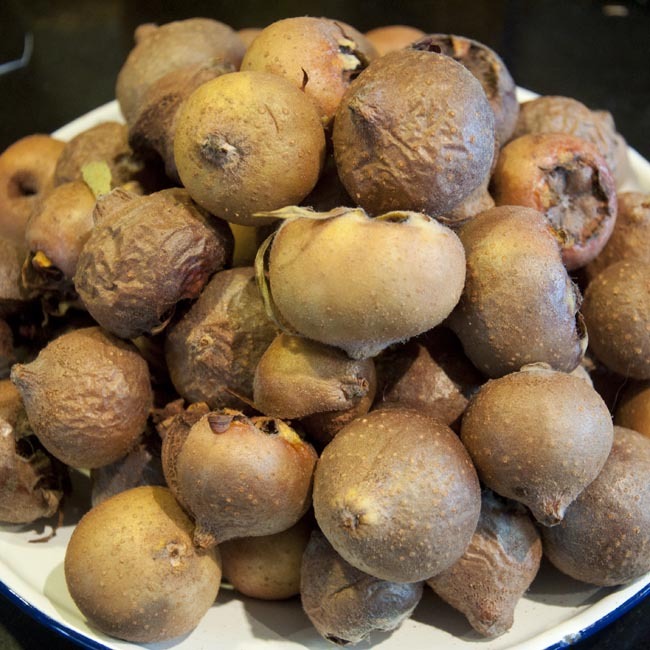 Of course, I had to taste the bletted medlars – I can report they’re a very unattractive mid-brown squishy substance, with a gentle sweet and slightly floral, perfumed flavour. Not unpleassant but nothing to get really excited about. 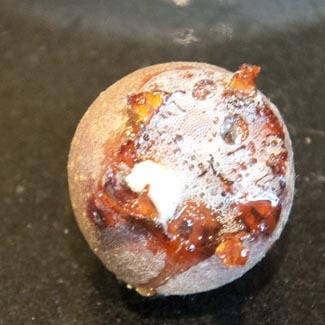 One of my medlars had started fermenting, it’s skin was tight with gas and there were bubbles escaping from the calyx (the ‘dog’s bottom’ bit of the fruit). 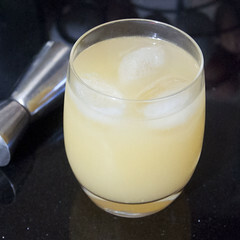 In the spirit of experimentation (and so you don’t have to!) I did have a little taste of the liquid leaking from this – again not unpleasant, a little more citrussy than the bletted medlar. I may have to look into medlar wine recipes! 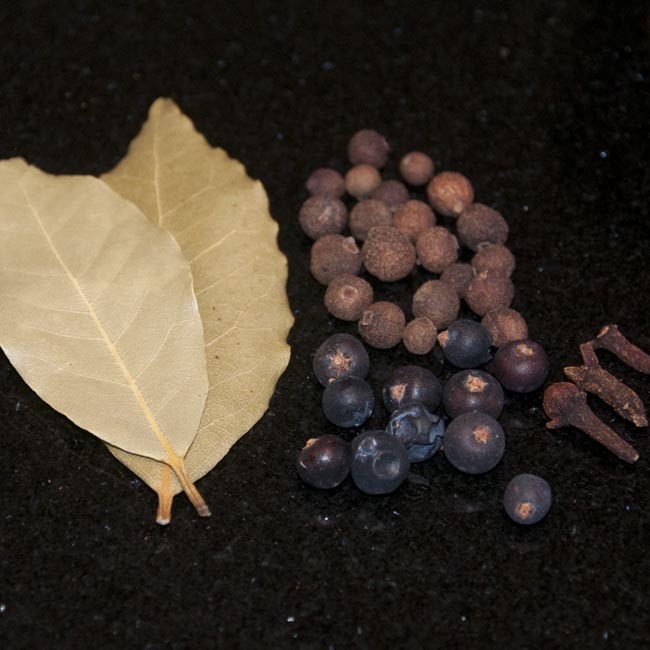 There were also a couple of medlars which were dry and hard and black in the middle. I threw those ones away. After consulting a few different sources (many recommended adding apples to the mix – something I wasn’t keen to do as I really want to see what medlars taste like!) 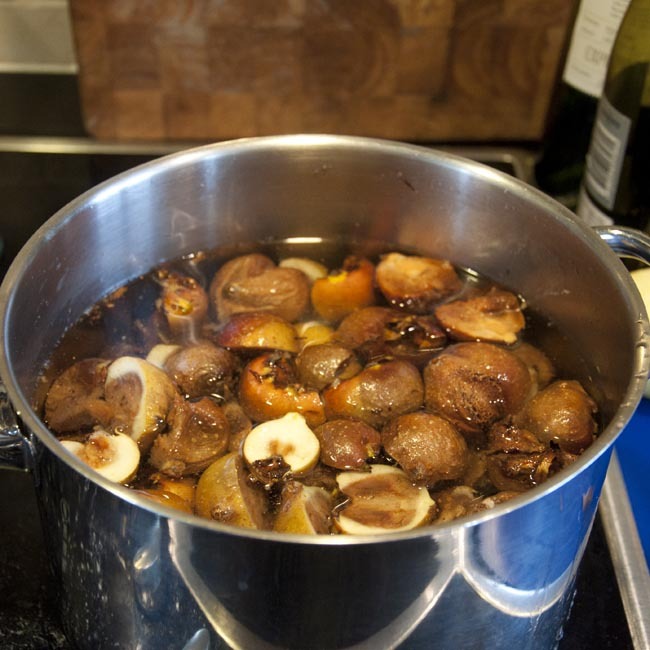 I settled on a very simple recipe – medlars, sugar, and just a squeeze of lemon juice into the stewing water, using my almost-all-purpose fruit jelly recipe. The liquor that drained from the jelly bag nearly had me giving up in disappointment. It was distinctly cloudy with a rather insipid pale brown colour, a bit like too-weak milky tea. A quick taste, and it was quite bland apart from a dominant flavour of tannin – like I’d been boiling up dry leaves and bark for an hour. It almost went down the sink, but since I wasn’t sure what it was meant to taste like, I decided to persevere. The result is a revelation – dark golden in colour, sweet/acid with a gentle floral top note and a soft tannin base flavour, quite unlike anything else you’ve ever eaten – my husband tried for several minutes to work out what it tasted ‘like’ before giving up on the exercise. The set of my jelly is a bit softer than I would have liked – to my pint and a half of liquor I added a pound of preserving sugar and half a pound of golden caster I had lying around. The jelly had been boiling for well over half an hour at this stage so I suspect the main problem was shortage of pectin from the quite well-bletted medlars. I don’t think it really matters! 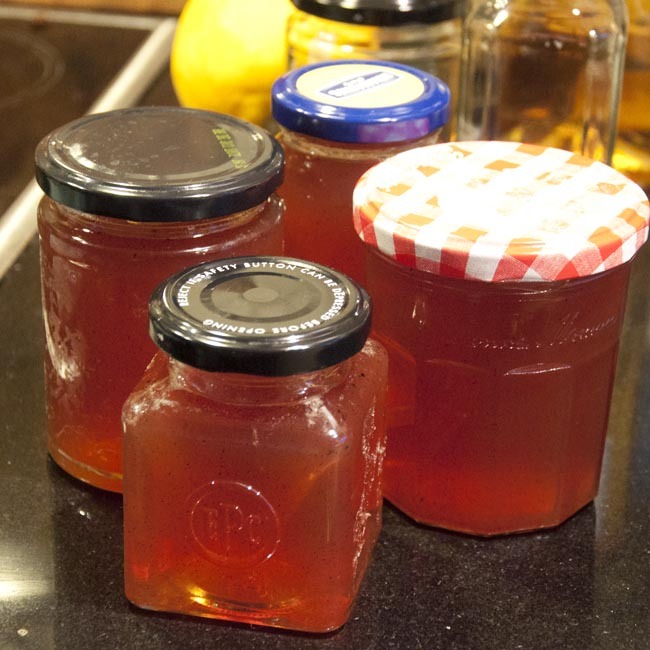 Until this year I had never made fruit jellies, out of a misguided belief that the process was needlessly tedious and fiddly – but a bumper crop of crab apples scrumped from a hedge finally forced me to give it a go. While there’s no escaping that it is a two-stage process – stewing fruit followed by straining and re-boiling with sugar – as hassle goes it’s certainly less trouble than taking stones out of plums for jam! Only the final boil and bottling requires your full attention, otherwise you can be getting on with other things – or putting your feet up with a well deserved cuppa! Fruit – single or mixed varieties – apples are a popular ‘base’ fruit with additions. A couple of kilos is a sensible quantity to try first time out and will probably make 6 jars or so. Sugar – I usually use preserving sugar for the additional pectin – this is particularly important for soft fruit which contain very little of their own pectins, apples and plums have quite a bit of their own and probably don’t really need supplementing. Still, it can’t hurt, right? Jam jars with lids, clean and dry. I like to re-use jam jars if I can, and save small pretty ones for jellies, to the eternal irritation of my husband who keeps finding empty jars all over the house. Jellies often have quite a delicate flavour, so do be careful the jars haven’t previously been used for pickles or curry sauce (give them a good suspicious sniff if in any doubt, and check the lids for staining – if so send them for recycling or use them for chutneys), as this could very easily taint your lovely jelly! Place the fruit in the saucepan and just cover with tap water. 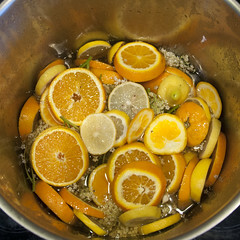 Add the citrus juice at this stage if desired. Bring to the boil and then cover and simmer gently for an hour or so, stir from time to time but don’t mash. Suspend your jelly bag over a bowl and spoon in your stewed fruit. A soup ladle is quite helpful here. 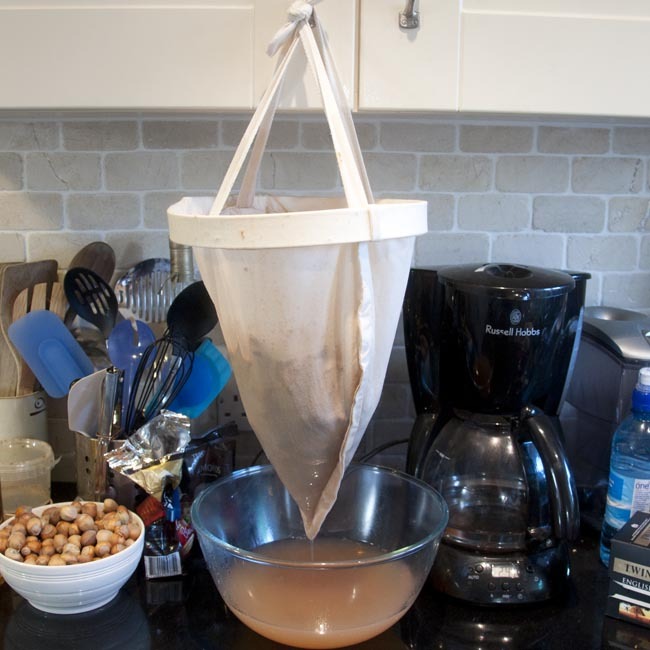 A jelly bag is a really useful thing to have if you’re making jellies (who knew?) but can be a bit expensive. You can bodge your own with a tied muslin. Many jelly bags have stands, but I just tie mine to the handles of the eye-level kitchen cabinets. The liquor that drains into the bowl will probably be cloudy. Don’t worry about this too much. You’ll see why in a bit. Leave it to strain for at least a couple of hours. When the flow of liquor from the jelly bag is almost exhausted, put the clean jam jars and lids in a cold oven and set the temperature to 150. Now, when the dripping is essentially stopped, measure the volume of liquor you have, preferably in pints (please note this recipe uses UK Imperial weights and measures, not US ones). 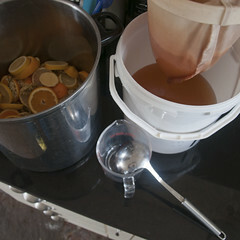 Then weigh out the sugar you need, following the rule of thumb of one pound of sugar to one pint of liquid. Return the liquor and the sugar to the (washed) pan, add any finely shredded herbs or spices (if you just want the flavour but not the pieces of herb or chilli etc in the jelly, you should have added them at the stewing stage so the pieces are filtered out – personally, I rather like the look of little nuggets of flavour in the final product), and bring gently up to the boil, stirring continuously. You now have a pan of quite concentrated boiling sugar syrup, which you should under no circumstances leave unattended. It will probably froth a little and some scum may well rise to the surface. I’ve seen recommendations to skim this but I never bother. At some point during the boiling process, with a bit of luck, the cloudiness will disappear entirely. No, I don’t know why, either. I think it’s that culinary alchemy again! Keep stirring, and check for setting periodically. I put a couple of small saucers in the freezer ahead of time, then put a drop of the boiling syrup on the saucer, it will cool quickly and allow you to check the consistency. It’s ready when the cold jelly wrinkles when you push it with your finger. Different jellies seem to reach setting point at very different rates, some will take as little as 10 minutes, so keep checking regularly. And tasting, of course. Once your jelly has reached setting point, carefully get the hot sterilised jam jars out of the oven, fill with the hot jelly and tighten the lids fully. If you have any pieces in the jelly, watch to see if they’re trying to sink or float in the jars – if they are, then invert the jars every so often as they cool to mix the contents. If you find, once they’re cold, that the jelly isn’t as set as you’d like, it’s perfectly alright to tip it back into the pan the next day, clean and re-sterilise the jars, and boil the jelly for a while longer. But assuming it’s mostly set, why would you bother unless you were planning an attempt on the local flower and produce show with it? That’s it! Label, store, and enjoy at your leisure. They should keep at least a year in a cool dark place, but best to refrigerate after opening. Doesn’t seem so hard, does it? Now, don’t you want to know what happened to those medlars..? 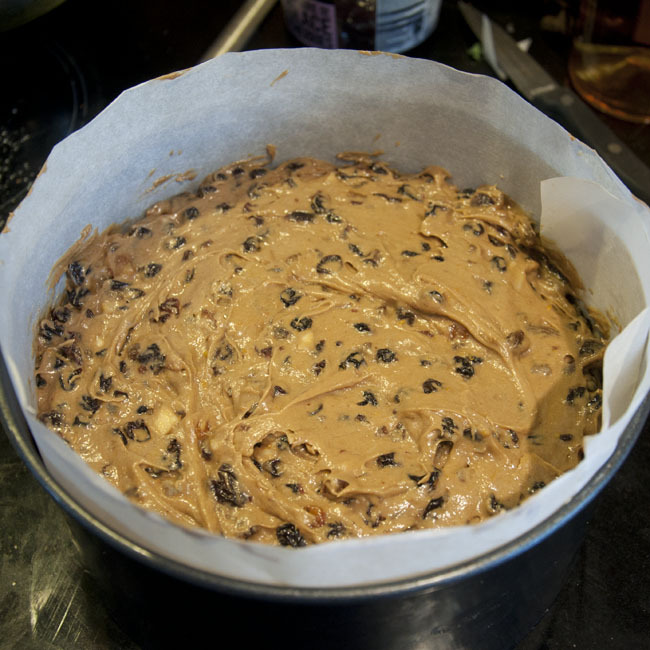 Today I baked our Christmas cake. I’m not going to insult your intelligence by claiming it’s my recipe – that credit goes to the great Delia Smith – but it is, in some sense, still a ‘family’ recipe. It’s the cake my mother makes, and the one I made with my grandmother when I was growing up. I still make it almost exactly like she did. The smell of citrus zest, calvados, and freshly grated nutmeg can only mean Christmas isn’t far around the corner. 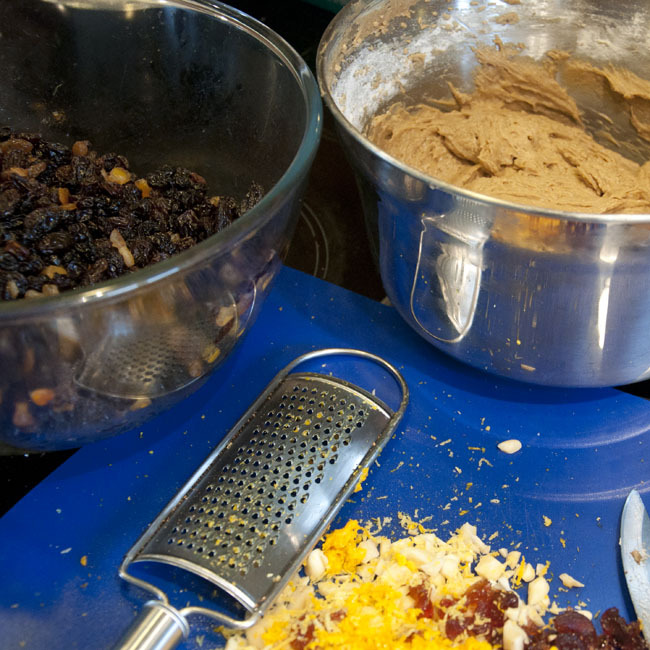 Folding the fruit into the cake mixture, heady scents filling the kitchen, is a mix of excitement about the festive season to come, and remembrance of past Christmases, and those we spent them with. 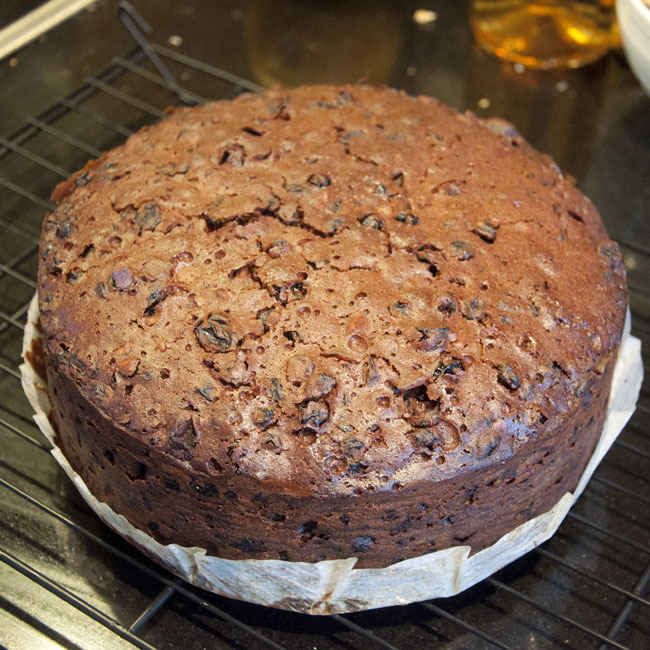 Every year, when I bake my Christmas cake, I think of Grandma – I remember making this cake with her, in her kitchen, all those years ago. In my first year at university, some time in November, I remember going into the big, academic bookshop, and digging out a copy of Delia’s Christmas cookbook. That year, I made my own cake, and I’ve made one every year since then. 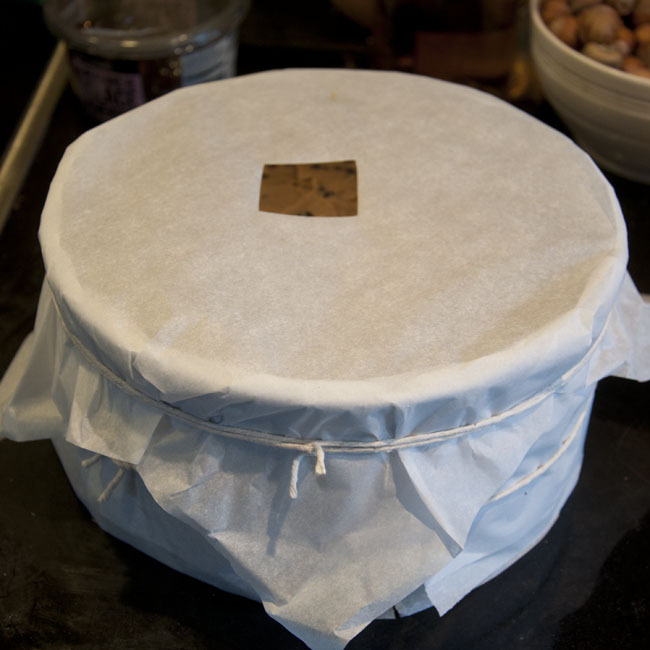 It still gets double-wrapped in baking parchment before going into the oven, just like my Grandma taught me. And even though the fashion these days runs more to smooth white icing, it will still get covered in marzipan and then daubed roughly in a royal icing snow-scene and topped with a marzipan poinsettia, just like my Grandma’s used to. Though of course I’ll probably only get around to it on Christmas Eve. Grandma I think would have been better organised! We forget too often these days what our food says about us, about where we come from, and the people we’re connected to. Seasonal foods – big obvious ones like Christmas cakes, as well as more modest ones like the first asparagus of summer – connect us with the turning of the seasons as well as back through our memories to previous years and previous feasts. I hope you enjoy your festive preparations, and create some new, wonderful memories with people you love! Don’t you love bunting? Not only is it very pretty, it seems to be bang on trend right now, if the smart interiors boutiques where I can’t afford to shop are anything to go by! A while ago, I (maybe foolishly) volunteered to make a load of bunting to help decorate the village hall for my little sister’s wedding reception. Before embarking on the epic effort, I thought it might be best to do a mini version to iron the kinks out of my process. 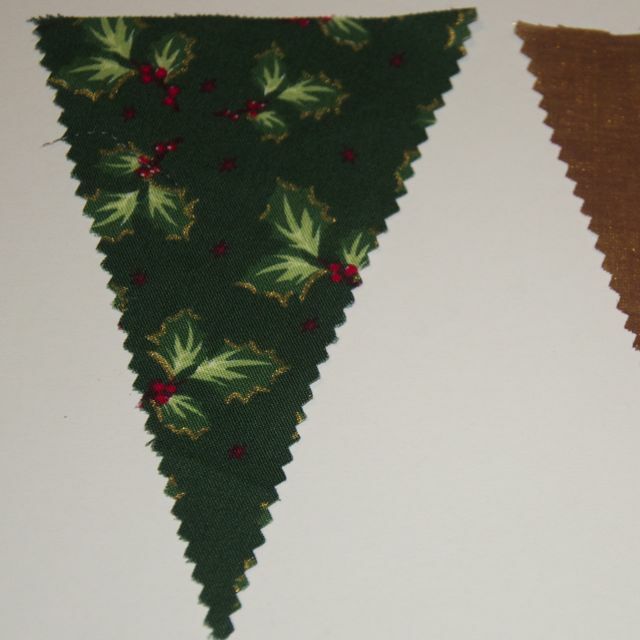 Christmas is coming, so what better than a bit of Christmas bunting for the hallway? Bias tape, as much as you want your bunting to be long, and the colour of your choice. Double fold tape will save you the fold-and-iron process, but may not be as easy to get hold of. Sewing thread to match or contrast with the bias tape. I find if I’m trying to match a colour and I don’t have a really close match – as in this case, all my greens were too light or too yellow – it’s better to find a neutral colour which matches the tone. I used a dark grey for this bunting. Some suitably festive fabric. I used mainly scraps left over from previous Christmas crafting. If you want to use new fabric a single fat quarter should be enough to make 6m of bunting with quite modest 4″ x 6″ pennants spaced 6″ apart. Realistically you probably have all of the non-consumables or none of them – 6m of bias tape cost me less than £2, and I had the leftover fabrics already. This is a single-sided bunting, if you use printed fabrics like I have. If you use fabrics which have two good sides, of course, you don’t need to worry about that. I like the effect of the pinking-sheared edges, and it saves an awful lot of time over hemming. Start by making your template. I drew mine out for triangular pennants 6″ long and 4″ wide at the top (the whole template is 20″ x 6″). 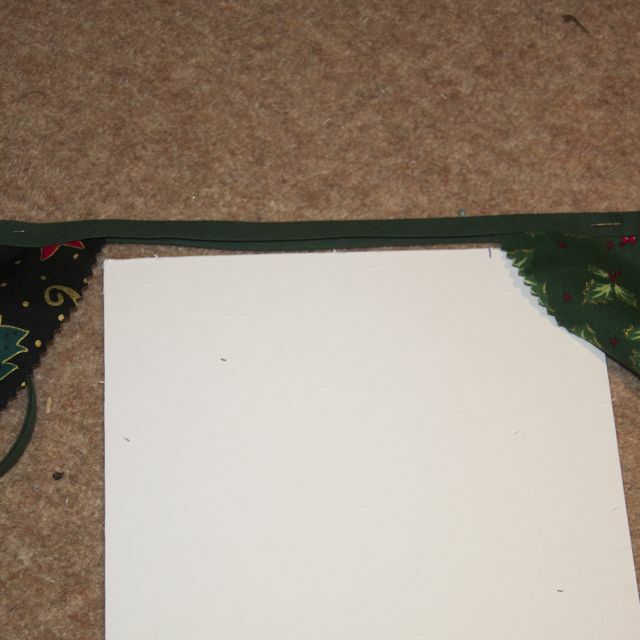 If you’re using lots of small fabric scraps, you may also make to want a template for a single or a pair of pennants. Give some thought to what spacing you’re going to want to have between your pennants. I went for 6″ – the same as the length of the pennant. Any more than this I think looks a bit sparse, closer and you’ll need more time and fabric to make extra pennants – at the end of the day it’s up to your taste! Work out how may pennants you’re going to need by applying some basic primary school maths to the problem. Remember to leave a bit more bias tape at the ends to give you enough to tie the bunting by. Using your template, mark up your fabric. I used a biro to mark up the back of the fabric. You might want to use something a little less crude, if you have it! Then cut the top of the pennants with the straight scissors, and the sides with the pinking shears. You’ll notice the lines I’ve cut aren’t quite strictly straight, because my pinking shears aren’t long enough to cut the side in a single action. I don’t think it matters! Once you’ve cut all your pennants, it’s probably a good time to iron them. At the same time, if you’ve bought single fold bias tape (bias tape which has the two edges folded in but isn’t yet folded in half) then use the iron to fold this in half and set the fold. Then decide how you want your pennants ordered, if they’re not all the same. 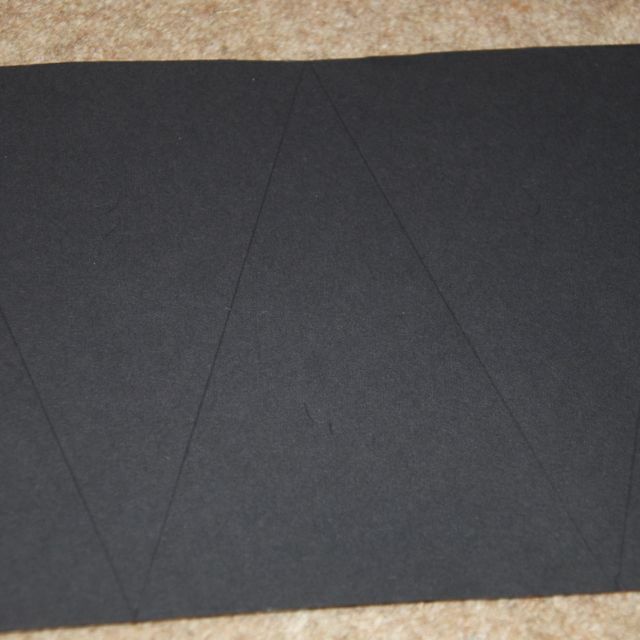 Now, starting from the centre to ensure they’ll be evenly distributed, start pinning your pennants into the bias tape. I marked my 6″ gap onto the edge of a piece of card to help me space them consistently – it’s quicker than using a measuring tape or a ruler every time. Try to be reasonably accurate but don’t stress over it. 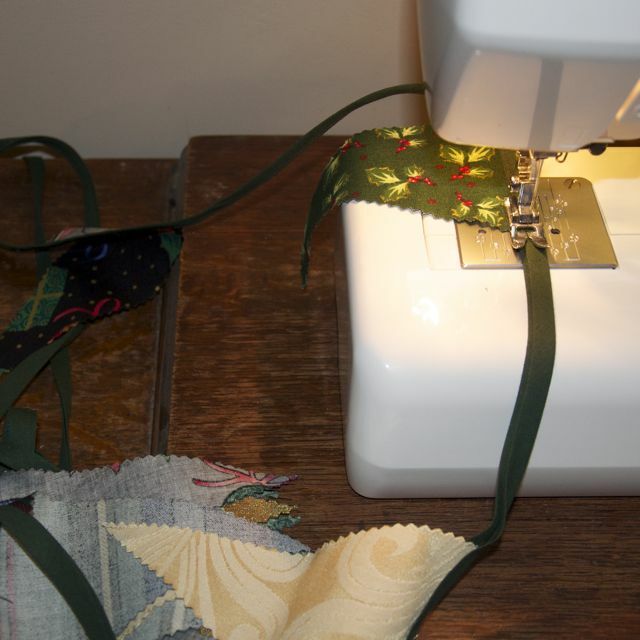 Once all your pennants are placed, it’s time to sew. I just used a single row of straight-stitch as close to the open edge of the bias tape as it was practical to do quite quickly. You could also use a zig-zag stitch, if you prefer. 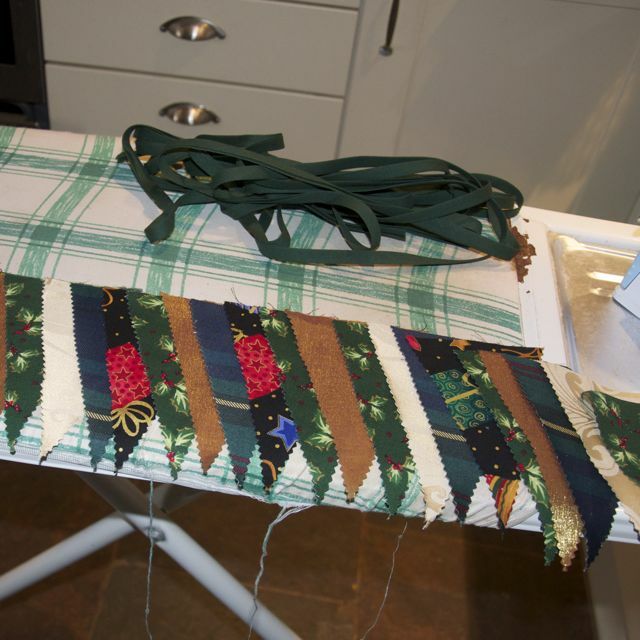 As you get to each pennant, just make sure the top is placed as far into the fold of the tape as possible, and lying nice and flat, before you sew it in place. That’s it, keep sewing until you’ve reached the end of your tape and all the pennants are secured in place. Doesn’t it look pretty? I can’t wait for Christmas now! 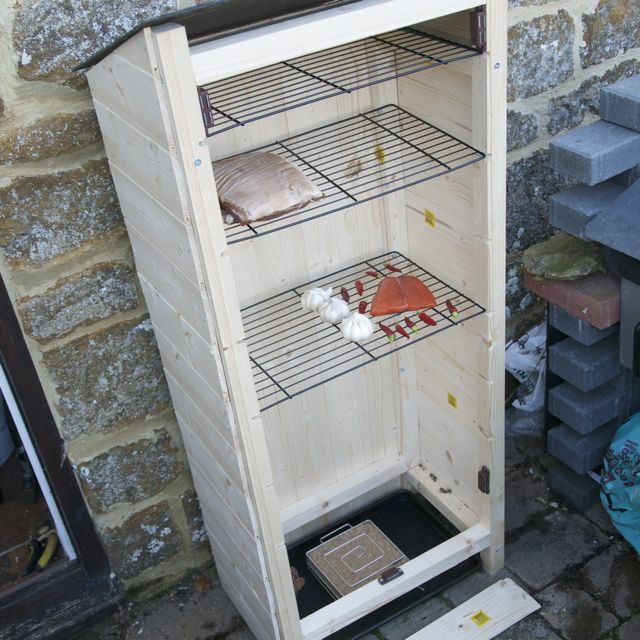 So I built a cold smoker, and then it was time to try it! 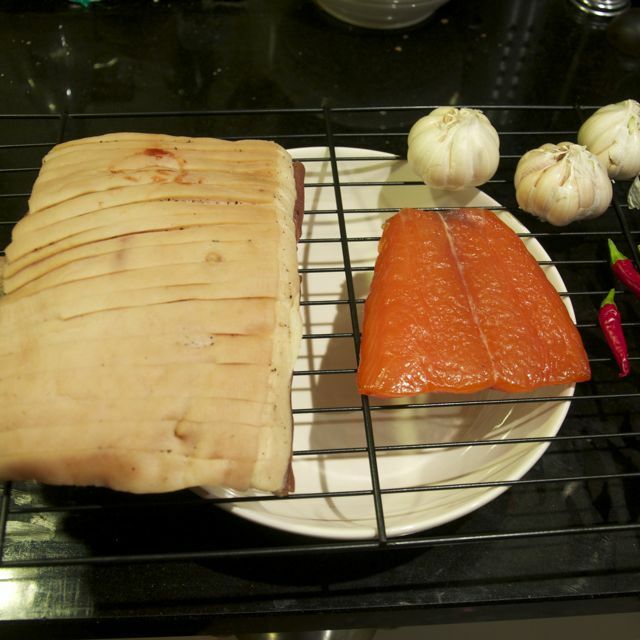 The items in my first smoke run were the cured salmon fillet, a piece of home-cured bacon, three garlic bulbs and about a dozen home-grown chillies. These were loaded into the smoker on the racks – I considered hanging the bacon piece from a hook but decided against this time. The loaded smoker looks really empty so the first lesson is to have more items ready for smoking and do them all at once. The ProQ smoke generator lit very straightforwardly and behaved immaculately, smouldering gently without any noticeable heat output for almost exactly the advertised ten hours. I used oak sawdust in the smoke generator for the first attempt, and the 100g pack I had was a little bit more than I needed. The smoker itself leaked like a sieve from the junction between the roof and box, and also from the side of the magnetically-attached door panel. I suspect this meant the smoke density inside the box was rather less than it might have been. Before the next run, I plan to plug as many of these leaks as I can using silicone mastic and some batons, and we’ll see if I get a more concentrated smoke as a result. I could conceivably run a second smoke generator, but this would increase my costs, so I’d rather not! Overall, the salmon was a great success. It was firm, glistened slightly with oil on the surface, and cooked wonderfully into the creamy home-smoked salmon pasta I made for dinner on Monday. You can see photos and more discussion with the recipe. The garlic and chillies didn’t appreciably change in appearance during smoking – at odds with the smoked garlic I’ve seen before which was dark yellow to brown in colour. I have seen recommendations for smoking times for garlic up to 36 hours, though, so 10 may not be enough to achieve this, especially in a leaky-smoker. 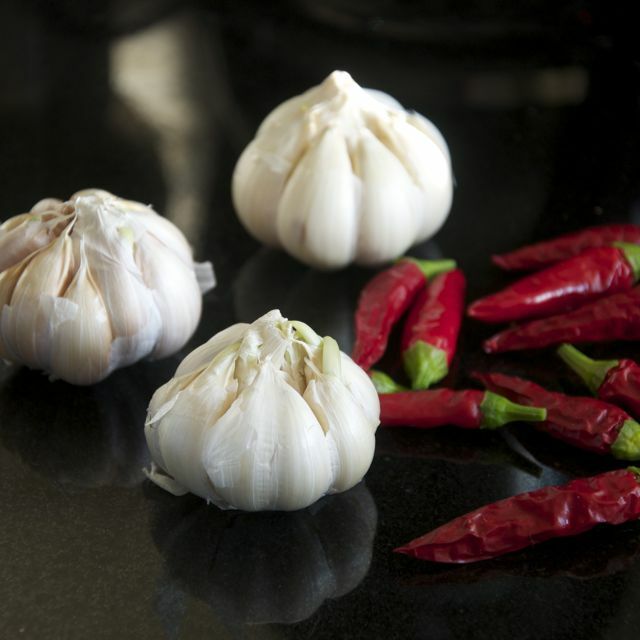 They smell wonderfully of oak smoke though and the flavour of the garlic is a treat – nice fresh flavour with a subtle but distinct note of oak smoke, not too obtrusive and lovely for general cooking. I might re-smoke one of the bulbs next time I run the smoker, if I’ve not eaten it all by then. The bacon has a bit of smoke staining on the rind and has darkened on the meat side. I think you might get more discolouration on the rind with the bacon hanging rather than sat rind-up on a rack. Apart from that, it looks and smells as I would expect from good smoked streaky bacon. I haven’t tasted it yet – but plan to have some for my lunch!